Outcome document from Beijing+5 translated into 11 national languages by KARAT: Albanian, Bulgarian, Czech, Hungarian, Macedonian, Moldavian, Polish, Romanian Russian, Serbian and Slovakian. KARAT Coalition translated and published the Report of the Ad Hoc Committee of the Whole of the 23rd special session of the General Assembly (the UN outcome document from Beijing+5) from English into 11 languages of countries from the Region. The print version of the outcome document is available in Albanian, Bulgarian, Czech, Hungarian, Macedonian, Moldovan, Polish, Romanian, Russian, Serbian and Slovakian. Published by KARAT, 2001. 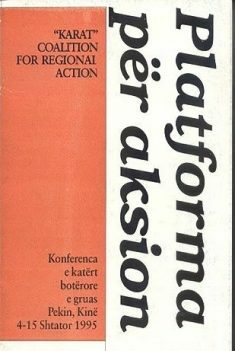 Leaflet: Platform for Action – summary, translated into 6 national languages by KARAT: Albanian, Bulgarian, Czech, Polish, Romanian and Russian. KARAT Coalition translated and published a summary of Beijing Platform for Action (PfA) from English into 6 languages: Albanian, Bulgarian, Czech, Polish, Romanian and Russian. The summary is in a form of handy leaflet. It was the first KARAT’s publication. The national version of the PfA leaflet was an important tool for KARAT’s members to raise the awareness about their governments’ commitments to women’s rights made at the Beijing Conference in 1995. The print version of leaflets is available in KARAT’s office. Published by KARAT, 1998.